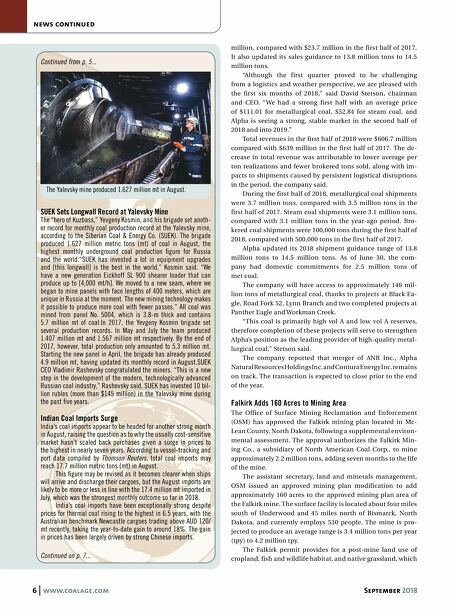 6 www.coalage.com September 2018 news continued SUEK Sets Longwall Record at Yalevsky Mine The "hero of Kuzbass," Yevgeny Kosmin, and his brigade set anoth- er record for monthly coal production record at the Yalevsky mine, according to the Siberian Coal & Energy Co. (SUEK). The brigade produced 1.627 million metric tons (mt) of coal in August, the highest monthly underground coal production figure for Russia and the world. "SUEK has invested a lot in equipment upgrades and [this longwall] is the best in the world," Kosmin said. "We have a new generation Eickhoff SL 900 shearer loader that can produce up to [4,000 mt/h]. We moved to a new seam, where we began to mine panels with face lengths of 400 meters, which are unique in Russia at the moment. The new mining technology makes it possible to produce more coal with fewer passes." All coal was mined from panel No. 5004, which is 3.8-m thick and contains 5.7 million mt of coal.In 2017, the Yevgeny Kosmin brigade set several production records. In May and July the team produced 1.407 million mt and 1.567 million mt respectively. By the end of 2017, however, total production only amounted to 5.3 million mt. Starting the new panel in April, the brigade has already produced 4.9 million mt, having updated its monthly record in August.SUEK CEO Vladimir Rashevsky congratulated the miners. "This is a new step in the development of the modern, technologically advanced Russian coal industry," Rashevsky said. SUEK has invested 10 bil- lion rubles (more than $145 million) in the Yalevsky mine during the past five years. Indian Coal Imports Surge India's coal imports appear to be headed for another strong month in August, raising the question as to why the usually cost-sensitive market hasn't scaled back purchases given a surge in prices to the highest in nearly seven years. According to vessel-tracking and port data compiled by Thomson Reuters, total coal imports may reach 17.7 million metric tons (mt) in August. This figure may be revised as it becomes clearer when ships will arrive and discharge their cargoes, but the August imports are likely to be more or less in line with the 17.4 million mt imported in July, which was the strongest monthly outcome so far in 2018. India's coal imports have been exceptionally strong despite prices for thermal coal rising to the highest in 6.5 years, with the Australian benchmark Newcastle cargoes trading above AUD 120/ mt recently, taking the year-to-date gain to around 18%. The gain in prices has been largely driven by strong Chinese imports. Continued from p. 5... million, compared with $23.7 million in the first half of 2017. It also updated its sales guidance to 13.8 million tons to 14.5 million tons. "Although the first quarter proved to be challenging from a logistics and weather perspective, we are pleased with the first six months of 2018," said David Stetson, chairman and CEO. "We had a strong first half with an average price of $111.01 for metallurgical coal, $52.84 for steam coal, and Alpha is seeing a strong, stable market in the second half of 2018 and into 2019." Total revenues in the first half of 2018 were $606.7 million compared with $639 million in the first half of 2017. The de- crease in total revenue was attributable to lower average per ton realizations and fewer brokered tons sold, along with im- pacts to shipments caused by persistent logistical disruptions in the period, the company said. During the first half of 2018, metallurgical coal shipments were 3.7 million tons, compared with 3.5 million tons in the first half of 2017. Steam coal shipments were 3.1 million tons, compared with 3.1 million tons in the year-ago period. Bro- kered coal shipments were 100,000 tons during the first half of 2018, compared with 500,000 tons in the first half of 2017. Alpha updated its 2018 shipment guidance range of 13.8 million tons to 14.5 million tons. As of June 30, the com- pany had domestic commitments for 2.5 million tons of met coal. The company will have access to approximately 146 mil- lion tons of metallurgical coal, thanks to projects at Black Ea- gle, Road Fork 52, Lynn Branch and two completed projects at Panther Eagle and Workman Creek. 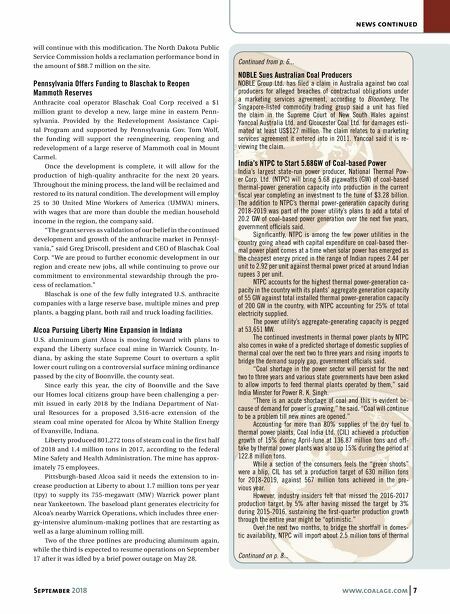 "This coal is primarily high vol A and low vol A reserves, therefore completion of these projects will serve to strengthen Alpha's position as the leading provider of high-quality metal- lurgical coal," Stetson said. The company reported that merger of ANR Inc., Alpha Natural Resources Holdings Inc. and Contura Energy Inc. remains on track. The transaction is expected to close prior to the end of the year. Falkirk Adds 160 Acres to Mining Area The Office of Surface Mining Reclamation and Enforcement (OSM) has approved the Falkirk mining plan located in Mc- Lean County, North Dakota, following a supplemental environ- mental assessment. The approval authorizes the Falkirk Min- ing Co., a subsidiary of North American Coal Corp., to mine approximately 2.2 million tons, adding seven months to the life of the mine. The assistant secretary, land and minerals management, OSM issued an approved mining plan modification to add approximately 160 acres to the approved mining plan area of the Falkirk mine. The surface facility is located about four miles south of Underwood and 45 miles north of Bismarck, North Dakota, and currently employs 530 people. The mine is pro- jected to produce an average range is 3.4 million tons per year (tpy) to 4.2 million tpy. The Falkirk permit provides for a post-mine land use of cropland, fish and wildlife habitat, and native grassland, which Continued on p. 7... The Yalevsky mine produced 1.627 million mt in August.